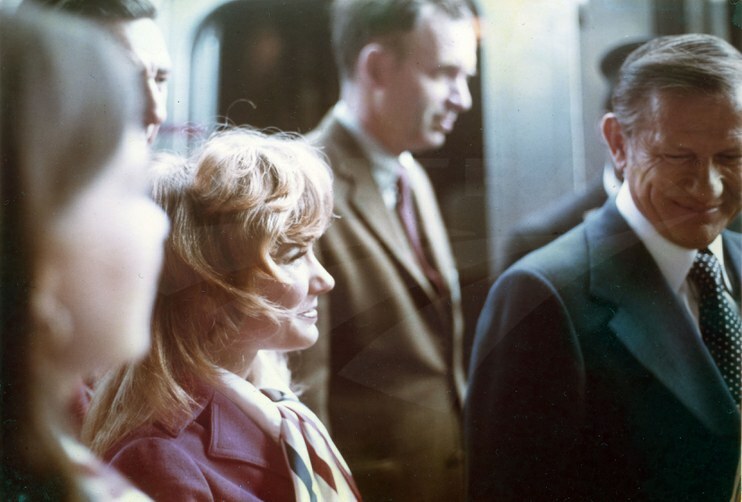 Tricia "Patty" Saunders (in red) looks towards the future as Amtrak begins operations in 1971. To her right is then-U.S. Secretary of Transportation John Volpe. Tricia “Patty” Saunders is a familiar face to many—although they probably don’t know her name. 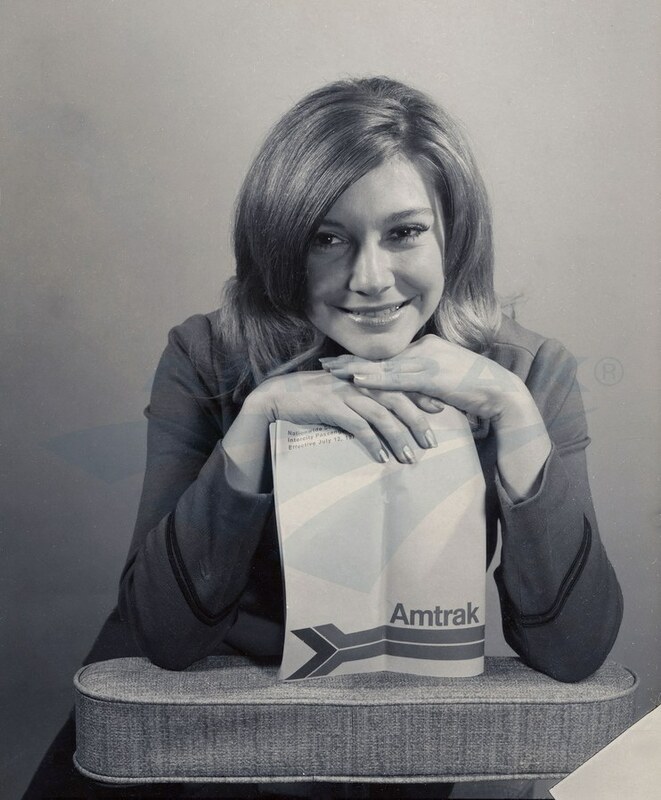 In her role as a public relations ambassador for Amtrak in 1972, Saunders traveled the country promoting the new company’s services and also modeled in early Amtrak photo shoots. Amtrak started operations on May 1, 1971 after an act of Congress the previous year allowed private railroads to divest themselves of their passenger service obligations. In transferring those obligations to Amtrak, those two dozen companies agreed to provide it with equipment, station facilities and access to their tracks. until Amtrak could paint everything in its first paint scheme. Within a few months, Amtrak needed to create an organizational framework; hire and train employees; upgrade and standardize rolling stock and station facilities acquired from predecessor railroads; institute a comprehensive national reservations system; and craft an advertising campaign to inform the public about its services. Amtrak actually had very few direct employees in its first years, as most functions continued to be contracted out to the predecessor railroads. This interim period allowed Amtrak to analyze current railroad operations and determine how to most efficiently run its services by combining redundant jobs. Over its first 18 months of operation, Amtrak took over essential services such as group travel arrangements, reservations and ticketing and on-board functions including work performed by stewards, chefs and sleeping car attendants. By the end of 1972, the company employed 1,522 people across the country. It also worked out an agreement with the predecessor railroads whereby their employees could switch over to Amtrak but have a six year window to return to their original jobs without losing established benefits. Saunders poses with the second national timetable. Prior to being hired by Amtrak on April 28, 1971 – as one of the company’s first employees – Saunders had worked two seasons for the Seaboard Coast Line (SCL), whose rail network covered the Southeast and the lucrative Florida market. The Sunshine State was especially popular with Northerners in search of a respite from harsh winter weather. A native of Richmond, Va., Saunders had been in modeling school when the SCL came looking for young women to work on its famous Florida Special (New York-Miami), a popular seasonal train that operated from mid-December to mid-April. She recalls that the SCL “hired six girls, one per train…we put on fashion shows onboard, showing off the latest styles for cocktail dresses, bikinis and other clothing.” The shows not only entertained passengers on the day-long journey, but also allowed large regional department stores such as Jordan Marsh to advertise their goods. Saunders might also lead a sing-along or oversee a bingo game – prizes included suntan lotion, fresh citrus and other Florida staples. “Amtrak was a completely new operation–they were exciting times. I loved the trains and like many others wanted to see it work...there were big plans to change it all." - Tricia "Patty" Saunders. With a primarily male workforce, “Amtrak needed women,” she says. In her first Amtrak position – as a passenger service representative (PSR) – Saunders was “the eyes and ears of Amtrak.” She assisted customers on the train, listened to their complaints and compliments regarding Amtrak service, talked about future company initiatives and passed on ideas for improvement to management. “Management was eager to hear from customers,” notes Saunders, “and their suggestions led to change.” She also solicited feedback from fellow employees. “At first there were lots and lots of complaints because of the raggedy equipment,” says Saunders. 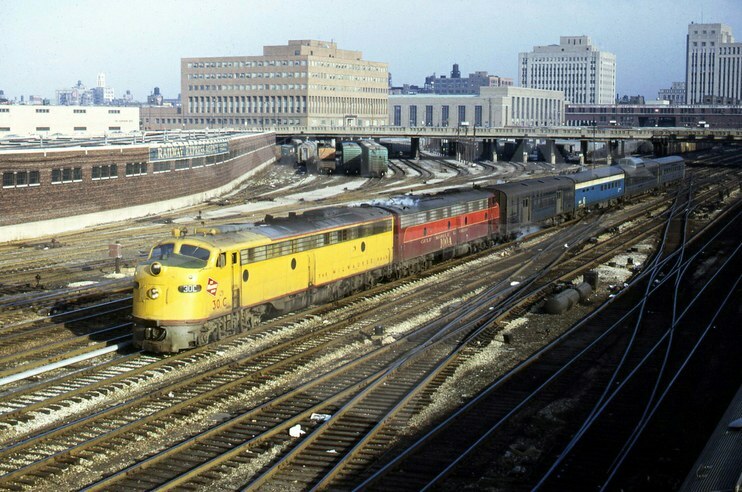 In preparation for the start of service in May 1971, Amtrak handpicked approximately 1,200 cars from a total pool of 3,000 held by the railroads. Updating the existing fleet of passenger cars and locomotives was one of Amtrak’s biggest challenges and would take years. Mechanical and electrical overhauls were needed on roughly a third of the fleet, as were interior refurbishments. 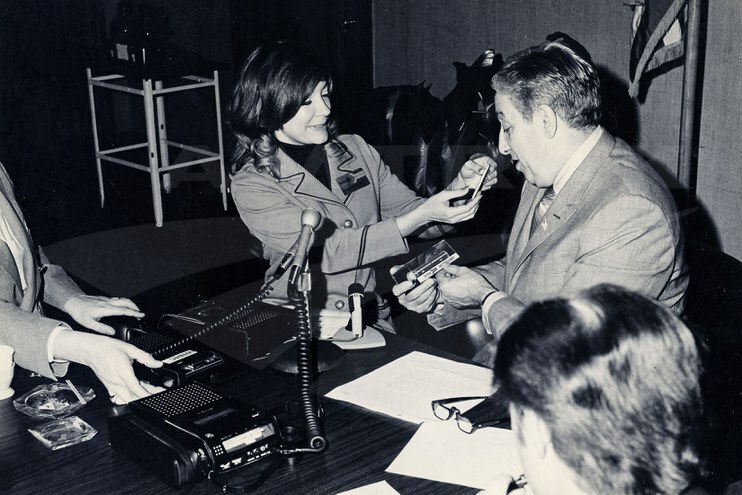 In an effort to promote Amtrak service, Saunders presents New Haven Mayor Bartholomew F. Guida with a model Metroliner car and button. Remembering those early days, Saunders says, “The older guys who had come over to Amtrak from the other railroads didn’t know what to make of us [PSRs]…they didn’t understand what Amtrak was going to be and thought we were sent to observe them. But we were just there to make things better.” Once they understood that the PSRs were there to help customers, the on-board service (OBS) members quickly learned to work with them, and they all became like family. In Part II, we'll learn about Saunders's participation in a national public relations tour, what she thought of the first Amtrak uniforms and her advice for those just starting a railroad career. 1 Kay Tucker, “Fla. Train Hostess Stays on the Go,” The Richmond News Leader, March 24, 1971. Amtrak History telephone interview with Tricia "Patty" Saunders took place on March 6, 2015. All quotes by Saunders are drawn from this interview.